Blue Topaz: Apartment with A/C in the Heart of the Village, Walk to Shops & Restaurants. Apartment, 1 bedroom, 1 bath sleeps 2-4. Village Apartment with A/C in the Heart of downtown La Jolla. Walk to shops & restaurants. 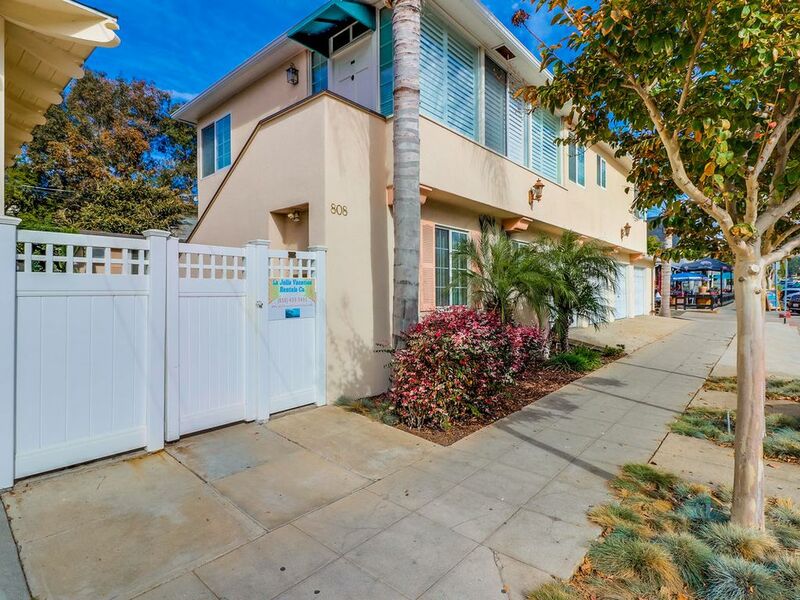 Located in the heart of the Village of La Jolla, The Blue Topaz is conveniently close to 24 hr residential street parking as well as just a few steps to some of the best restaurants in town. The Blue Topaz offers all the comforts of home. This great unit comes equipped with new flooring, a newly remodeled kitchen with stone countertops, new cabinets and a new oven. There is a flat screen TV in the living room with a wide variety of channels for your viewing entertainment as well as free WIFI. There is a queen bed in the master bedroom and a pull out full size sofa sleeper in the living room. A table for 4 is available in the living room and the kitchen comes fully equipped with all the essentials, such as, utensils, plates, pots & pans, coffee maker, microwave etc. The Blue Topaz has a lovely private shared courtyard with a fresh, clean coin laundry room that also provides a locking storage area holding all your beach needs. Beach chairs, beach towels and beach umbrella are available for your use. Additional storage is available for your suitcases and any other personal property you would like to have secured during your stay. Walk out the front gate and you are next door to some of the best restaurants in town. The Cottage, Tapenade and Public House are just steps away. Stroll down to Prospect St and visit the many boutiques, art galleries and coffee houses. The Museum of Modern Art is a short walk away as is the La Jolla Recreation Centre. You will have your choice of some of the most wonderful beaches in Southern California. Walk down to the Cove beach and along the coast you can see the Seals catching some rays on the beach. A short drive or 20 minute walk to La Jolla Shores Beach and if you head south you can be at Marine St Beach and Windansea in less than 15 minutes strolling along the beach. If you decide to leave La Jolla, it is a short drive to The World Famous San Diego Zoo, Seaworld, Balboa Park, Seaport Village, The Gas Lamp, Petco Park and Legoland. The Blue Topaz really does have it all. This is a NON-SMOKING home. This includes patio, and building common areas. This property is located among other units in a shared apartment property. Please respect your surrounding neighbors. Our rental agreement includes a no tolerance policy regarding excessive noise, occupancy and/or parties. Evictions are strictly enforced if at any time our guests choose to disregard this rule. This home is pet friendly. Pets are never to be left alone in the homes uncrated. If you plan on spending time away from your pets please find a doggy day care or crate your pet. You can call our office for recommendations or check the Welcome Book. This particular property has a 1 dog limit and the pet cannot exceed 20 lbs. There is a pet fee of $25/Night per pet - monthly stays will be discounted at a flat rate. Please make sure you are comfortable with these policies before renting with La Jolla Vacation Rentals. Bath towells and Beach towells. Surprisingly affordable - excellent location! We stayed at Blue Topaz and it was wonderful. Amazing location and extremely walkable. All the amenities we ever needed. The bed was one of the most comfortable beds I've ever slept in. We did not hang out at the apt very long otherwise it would have maybe been nicer if we had more of a view. You have no real view - just a street at ground level. But when you're sleeping, that doesn't matter. We will definitely be back as it was very affordable and perfectly comfortable. Michael communicated well and even returned our call after hours! Location was such a plus! Was the quality I expected for the price of the rental. This property is one of the cheaper house/condo rentals you can get in la jolla and it was the quality I expected for the price. There were a few problems: the bathroom had a leak coming from either from the shower or the toilet. I also wish the patio was in the sun and not in the back alley way, and it was quite loud in the mornings because it was right next to a breakfast restaurant that gets food shipped very early in the morning. If you are someone that likes to sleep in or are a light sleeper this would probably drive you crazy, but I am a morning person so it didn't bother me too much. Parking was difficult as I think it is all across San Diego, and some days we had to park several blocks down the street. If you are considering staying anywhere in la jolla and are renting a car it is worth it to get a parking spot even if you have to pay extra. That being said, the price of this rental condo was good and the house had all the amenities I needed: two tvs, fully stocked kitchen with a stove oven coffee maker toaster microwave and full sized fridge (only missing a dishwasher), and a washer and dryer. The pull out couch came in handy although I wouldn't say this property houses 4 people it really is for two people since there is only one queen sized bed. It is also a short walk to prospect street and the beach and close to tons of places to eat and shop. It is very close to the 30 bus line, if you are using public transit. The house rental company la jolla vacation rentals was also very professional, and sent me several emails and phone calls answering any of my questions and gave me all the information I needed to know before arriving at the condo rental. Overall it was a good stay, but I think I will try a different place with this house rental company when I visit la jolla next year. This rental was perfect for what we needed for a weekend in La Jolla. The location is perfect, right next to plenty of restaurants, bars, bakeries, and a very short walk to the beach. The space was very comfortable for 2 adults, and also very clean. La Jolla Vacation Rentals offers excellent and speedy customer service and I would absolutely rent with them again! About the area: "La Jolla"
One of the top beach destinations in the world! With a dramatic coastline boasting incredible views, it's no surprise that La Jolla is one of the most popular beach destinations in California. Surrounded on three sides by the sea and backed by the steep slopes of Mt. Soledad, La Jolla's natural beauty, abundance of activities and upscale village lifestyle ensure that it lives up to its nickname as "the jewel" of San Diego. Consistently voted one of the top beach destinations in the world, La Jolla offers a wide range of accommodations from luxurious hotels to casual coastal retreats, along with museums and art galleries, one-of-a-kind boutiques, great restaurants and a slew of outdoor activities. Home to the famous Torrey Pines Golf Course and The Lodge at Torrey Pines, the scenic cliff area offers well-groomed hiking trails with spectacular views, and world-class golf. At Torrey Pines Gliderport you can soar out over the beach cliffs on a hang glider or just relax and watch the action above. Along the dramatic coastline lies Scripps Park, where families can picnic throughout the summer, while enjoying Fourth of July fireworks and concerts under the stars. Just south of the park is the Children’s Pool, where a seawall was originally built to protect kids from incoming waves, but has been long taken over by a local seal colony. People are no longer permitted to swim here, but you can walk out along the seawall for a close-up view of the wildlife. La Jolla is also home to Birch Aquarium at Scripps Institute of Oceanography and plenty of cultural attractions including the La Jolla Playhouse and the Museum of Contemporary Art, all situated in close proximity to The Village. The University of California San Diego, which hosts the popular Geisel Library and the Salk Institute for Biological Studies, are both located in La Jolla as well. La Jolla's biggest draw for locals and visitors alike are the beautiful beaches. During the summer and autumn months, the surf is relatively gentle, with warm waters in 70s. Swimmers, snorkelers, scuba divers, kayakers and surfers can enjoy the golden sands of La Jolla Shores, the Cove and Windansea. And be sure to keep an eye out for migrating whales off the coast as they travel to and from Baja California.